I know you’ve seen them. We all have. Everybody and their uncle (momma, cousin, auntie, sister-in-law twice removed) has a list of rules they uphold to be true of any writer. I’ve come to give you my professional opinion: It’s a load of crap. Now, just wait a minute and hear me out. Like most things in the writing business, those writing rules are completely subjective. To clarify, I’m not talking about craft rules specific to genres. You need those. Even if you plan on writing the next best thing and want to shake things up a bit, you should probably know the rules you wish to break. Those lists of writing rules are great if you take them with a grain of salt and acknowledge not everything works for everybody. On the other hand, they do become problematic when you take them as law and they make you feel like less of a writer. I encourage you to create your own list of rules and tweak them as you discover what does and doesn’t work for you. After all, writing is a process. Treat it as one. I’m including my personal list of writing rules that work for me. Feel free to share your own. Don’t write every day. Give the ideas and words time to simmer in my mind. Only revise as I write if I leave TrackChanges on. Save different versions of manuscripts by date. Stop acting like I don’t need an outline. I always eventually do, even if it’s a reverse outline. If writing seems like a chore, see if there’s something in the manuscript that’s keeping me from wanting to dive back in. At least read a writing blog or article if I’m wasting time on social media. I’m sure I’ve mentioned this before: my mom was all about representation when I was younger. Sure I lived in a predominantly Black neighborhood and attended a predominantly Black church, but school was on the other end of the spectrum. I was in one of those gifted and talented programs, and there were only a handful of people of color in it at any given time. Clearly I learned a great deal, but there were also a few experiences that clearly stand out from the rest. My third grade math teacher was a Black woman. I don’t remember her last name, but I remember her first name was Bathsheba. She probably didn’t know it, but she made my day–Every. Single. Day. Her being brown made me feel less awkward, less alone. Seeing her made me feel like maybe I could grow up and feel like I could have an important job too. Maybe I could even be teacher. In my elementary years, I was also introduced to the first Black characters in a school-assigned book. My English teacher was white, and I couldn’t tell you her name now if my life depended on it. But I am thankful for her. Having followed the traditional route of reading what most kids read, what you naturally assume are books featuring non POC–Where the Red Fern Grows, James and the Giant Peach, Charlotte’s Web, Bridge to Terabithia, etc., imagine my surprise when we started reading Roll of Thunder, Hear My Cry. Brown characters! Brown characters all around! I guess this class was also when I had my first of what we would now call “woke” experience. I was surrounded by white people and was reading about ill-intentioned white people. It was a new layer to the feeling of difference. But, I was reading about brown people. It was also the first book I remember making me cry. It was also important because it was the first POC book that I remember beyond Aesop’s fables. Yes, it was also dated, but it made me feel relevant. The first two events sparked something another first-the first time I changed my mind about what I could be when I grew up. Maybe I could write too. I vaguely remember that we had a reaction assignment. I remember writing about slaves. My Uncle read it before I turned it in, and I remember him asking if I’d really written it because it was really good. My teacher also thought it was good. Maybe that’s when I first became a writer. It just took me until my 30s to remember my purpose and step back into it. I took an unexpected detour on my writing journey and did a bit of editing. How did that happen? An old college friend who knew of my published picture book quest reached out to me. When she told me of what she and a colleague wanted to do, I couldn’t say no. They didn’t just want to write a picture book, they wanted to birth a unique character to add to children’s bookshelves. That’s just what they did. Ti and Lora created a perfectly imperfect African-American girl character. Think on that. Two African-American women from Philly saw a void and filled it. It’s as simple as that. See a need. Fill a need. While self-publishing can come with its difficulties, they persisted. Their community of friends, family, and loved ones helped their dream become a reality. 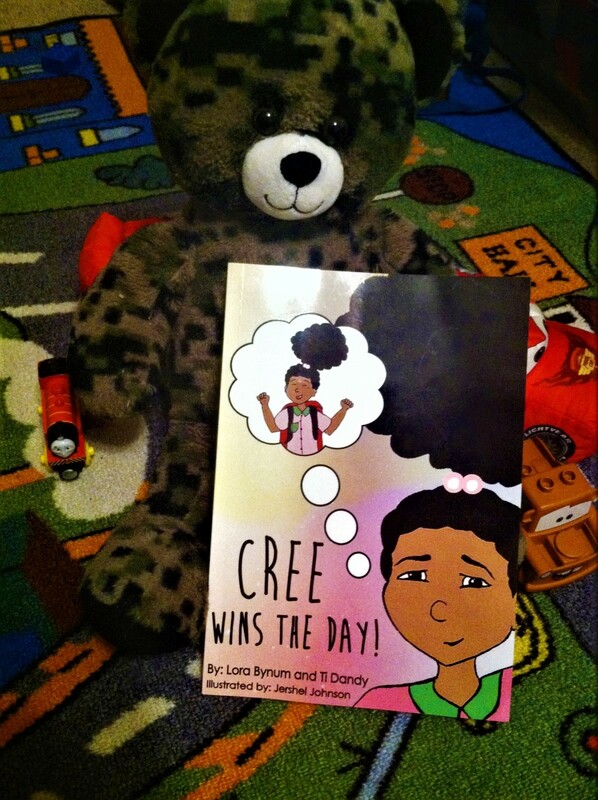 Not only did Cree win the day, Lora and Ti did as well. Cree embraces what makes her different. Cree’s abilities, that sometimes make her days a little crummy, show readers that our day-to-day lives may not be perfect or go as expected and that’s okay. We should always love ourselves and know who helps us to have a healthy mental space. That’s a lesson anyone can get behind. My writing. My baby. My fitted sheet? I know lots of people who consider their writing to be their babies. I’ve had students say it. I have writing friends that say it. I understand that you give birth to an idea. You nurture it and watch it grow. Then, you send it out into the world, hoping that it can not only survive but thrive. It makes sense. If I try to do it quickly, I cannot fold a fitted sheet to save my life. (Let’s be honest. I can barely do it slowly.) I have to really concentrate on it, and I always try multiple times in order to come up with something that I wouldn’t be ashamed to have someone else see. Shame? Yes! That keeps me far away from the “I can write this in one draft” mindset. No, Ashley. No you cannot. The fitted sheet mentality ensures that I get critiques and review my writing with a critical lens rather than a rose-colored one. Besides, you can’t have everyone in you linen closet with things all in disarray. Posted in WritingTagged craft, critique, feedback, fitted sheets, idea, learning, productivity, writer's life, writing process, writing progressLeave a Comment on My writing. My baby. My fitted sheet? To those of you currently battling snow of epic proportions, I apologize if the title alone made you roll your eyes. However, I promise that no other title was better suited. Compared to others, my writing journey is still in the beginning stages. Yes, I have had some wins along the way, but in regards to time, I haven’t been at this for multiple years. When you see announcements of others striking multiple book deals, it is easy to loudly applaud them while internally wishing you could pelt them with an arsenal of snowballs. After all, you want to take them down, not actually hurt them. It’s hard to not be jealous. You want your name announced. You want your book on shelves. You want a spot on the illustrious bookshelf of the chosen few. But, here’s something to keep in mind: While you were busy wallowing in your melting snowball arsenal, you missed all of the grunt work that someone else was doing. Ah, the iceberg of success. If you’ve ever tried to reach any type of goal, this image should be burned into your brain. As writers who have not yet tasted the sweet fruit of success (and the type and taste of said fruit will vary from writer to writer), we must keep in mind that we are likely unaware of the setbacks, missteps, and failures that another writer has had to endure. We are likely too much in awe of acquisitions announcement to even think about this sometimes. As much as you want a rea l check, don’t discount the importance of a good ole reality check. For me, I had to ask myself if I was doing all that I could to improve my craft. Was I seeking enough critiques from quality critique partners? If I wasn’t happy with the critiques I was receiving, was I actively seeking to get better feedback elsewhere? Was I using my time wisely? Was I paying attention to what was selling? Was I using mentor texts? See, there are plenty of things to do to make sure that you’re crafting the best manuscripts that you can. Besides, I don’t want to just be on a bookshelf. I want to leave a mark on the entire library. Back to work! "Every idea ain't a good idea!" I’m not sure which older person in my life said this to me, but I certainly remember hearing it more than once. I also know that it rings very true. I don’t expect to love every idea. I don’t expect to use every idea. I don’t even expect every idea to be good. I do expect to hold on to my list for quite some time. What’s the point of holding onto ideas you’re not swooning over? Some ideas may merge, mutate, or morph into something really great. Some ideas may springboard you into writing a great project that you had never really considered. Don’t overthinking thinking at the last minute. Posted in WritingTagged brain storm, brainstorming, idea, learning, overthinking, story storm, StoryStorm, Tara Lazar, thinking, writer's lifeLeave a Comment on "Every idea ain't a good idea!" I have focused goals for this year. It took me less than a week to get distracted. To be fair, I was only distracted for a few days. I saw a call for children’s TV pitches, and one of sought after themes just so happened to align with an idea I’d been fooling around with. Do I know anything about pitching a children’s TV series? Nope! Did I let that stop me from seriously considering this? Nope! I won’t keep you in suspense. I decided against actively pursuing the opportunity. I can proudly say that I’m more motivated than ever to continue writing on this #MuseMonday. So, remember when I got that Rate Your Story scholarship to use for this year? Honey, I’ve already been putting it to use. I’ve submitted 3 picture book manuscripts so far, and I’ve already received feedback on two of them. I’m not going to lie to you in this blog, ever. I pouted when I saw my feedback. I thought these early drafts were pretty good. They’d been through a couple of critique partners who said they were pretty good. Let me just say that good critique partners are great, but a critique from a professional (particularly someone more seasoned that you are) is invaluable. Truthfully, the feedback I got was more than just feedback. It was an honest critique. It eloquently told me what needed to be improved, offered concrete suggestions, and pretty much told me to try again. There wasn’t a bunch of added fluff to cushion my fragile writer’s ego. Nope! I understand the compliment sandwich, but critique partners can sometimes get too focused on the compliment part. I’ve printed out my manuscripts, along with the feedback I received. I’m going to return to them in a couple of weeks with fresh eyes and new inspiration. I’ll let you know how it goes.